Discover what could be the best essential oils to have on hand to help relieve stress, body aches, inflammation, and possibly to naturally treat and prevent various ailments. Essential oils are created by taking the plant cells of tree bark, leaves, flower petals, and stems, and separating their volatile oils from water and other materials found within. The best essential oils are extracted naturally with steam or water, or can be extracted with the use of mechanical pressure. There should be no added chemicals or compounds in these pure essential oils, which have been used for centuries for healing purposes. The essential oil you choose to treat a given health condition will depend highly on its individual composition, how it is used, and the way the body reacts to the oil internally. The plant’s origin and growing process may also alter the composition of its elements. Below is a rundown of 20 best essential oils, their natural properties, and the potential health benefits. Contains the minerals manganese, potassium, calcium, and magnesium. It is used for anemia, osteoporosis, acne, gum disease, toothaches, premenstrual syndrome, and yeast infections. Clove oil may work as an anti-inflammatory, could boost energy and promote good blood circulation. Has powerful antispasmodic, antiseptic, antibacterial, antirheumatic, and stimulant properties. It could potentially treat anxiety, muscle cramps, infections, wounds, varicose veins, and cellulite. Cypress oil may also promote blood clotting, eliminate toxins, and target respiratory issues. Offers antibacterial, antiseptic, anti-inflammatory, antimicrobial, and analgesic remedies. It may work to treat pain, colds and flu, fever, congestion, cold sores, dental problems, open wounds, and burns, fungal infections, and ulcers. Eucalyptus oil reportedly stimulates the immune system, alleviates arthritis issues, lowers blood sugar in diabetics, and targets bladder disorders. It can also be found in perfumes and as an agent in industrial cleaners. Contains antimicrobial, analgesic, anti-inflammatory, anti-arthritic, and anti-proliferative components. Treats pain, inflammation, indigestion, colds and flu, sores, acne, stretch marks, and scars. Frankincense oil targets the brain to improve memory and learning, as well as treat brain tumors, asthma, diabetes, and cancer. Has anti-inflammatory, antioxidant, and pain-numbing properties. It may work to support joints, reduce inflammation, fight infection, promote good digestion, and alleviate vomiting and nausea. Ginger oil could treats menstrual pain, muscle pain, upset stomach, respiratory issues, anxiety, motion sickness, heart disease, and acts as a natural aphrodisiac. Has antioxidant and antibacterial components as well as phytochemical limonene to assist in the fight against harmful pathogens. It may treat muscle aches, anxiety, respiratory infections, inflammation, yeast infections, acne, bloating, and promotes toxin elimination by the liver. Grapefruit oil is used to boost energy and metabolism, promote weight loss, regulate fluid retention, treat arthritis, regulate blood circulation, curb sugar cravings, and cure hangovers. Contains anti-inflammatory, antimicrobial, antiseptic, and antioxidant properties. It may work to treat cuts, wounds and burns, headaches, stress, skin problems, and boost mood. Lavender oil is commonly used to treat insomnia by prompting physical and emotional relaxation and reduces anxiety. Offers antioxidant, antiseptic, antifungal, astringent, carminative, stimulant, and calming properties in the outer skin, or peel. May treat stress, upset stomach, coughs, infections, sleep deprivation, digestion, fatigue, fever, respiratory issues, skin problems, and promotes weight loss. Lemon oil has d-limonene used to fight cancer. Contains antioxidant, analgesic, antiseptic, anti-inflammatory, antibacterial, and anticancer properties. It may work to treat skin conditions, stress, hormone imbalances, wounds, aches and pains, colds, congestion, coughs, digestion issues, and circulatory problems. Myrrh oil is used as a paste for sprains, bruises, and arthritis pain. Has antioxidant, antifungal, antibacterial, anti-inflammatory, antiviral, and antibiotic components. It may treat weak immune systems, digestive issues, skin problems, muscle pain, sinus infections, upset stomach, sore throat, wounds, and nail fungus. Oregano oil targets respiratory, urinary tract, and yeast infections, allergies, and menopause symptoms. Offers antimicrobial, antiviral, antifungal, anesthetic, and antispasmodic components. it may work to treat pain, nausea, colds and flu, digestive issues, headaches, stress, restore energy, muscle tension, and respiratory congestion. Peppermint oil could refresh breath, promote mental clarity, improve blood circulation, and irritable bowel syndrome. Contains antioxidant, antimicrobial, antiseptic, anesthetic, antibiotic, antiviral, and astringent properties. It may treat acne, stress, anxiety, hormone imbalances, wounds, fever, muscle spasms, infections, and digestive issues. Rose oil could help with depression, constrict blood vessels to stop blood loss, tone abdomen muscles, and act as an aphrodisiac. Has antioxidant and anti-inflammatory components that could treat pain, stress, indigestion, respiratory issues, cough, and headaches. 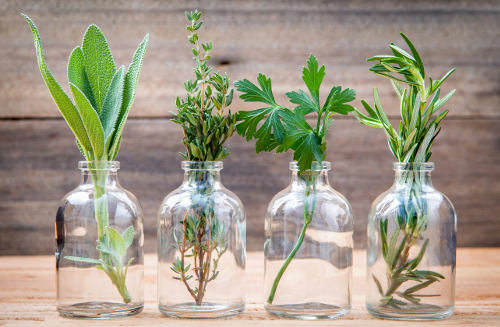 Rosemary oil may boost memory, the detoxification process of the liver, promote gallbladder function, and help the immune system to work at its fullest extent. Contains antiviral, anti-inflammatory, antimicrobial, antibacterial, antiseptic, antifungal, stimulant, and expectorant properties. It may work on muscle aches and pains, acne, cold sores, congestion, skin conditions, wounds, and possibly boost new cell growth. Tea tree oil may also promote proper blood circulation, kill head lice, and work as a natural hand sanitizer. Offers anti-inflammatory, antiseptic, antispasmodic, astringent, and expectorant. It may treat wounds, infections, muscle spasms, skin conditions, digestive issues, coughs, circulatory problems. Sandalwood oil could improve memory and concentration and was once used by Egyptians for embalming purposes. Has anti-inflammatory and antioxidant properties with its fatty acid gamma-linolenic acid. It may work to treat skin issues, hormone imbalances, fatigue, anxiety, aches and pains, stress, and swelling. Borage seed oil could treat osteoporosis, menopause symptoms, rheumatoid arthritis, diabetes, heart disease, and alcoholism. Contains antioxidant, antiseptic, carminative, diuretic, and stimulant components. It may treat stress, anxiety, muscle aches and pains, premature skin aging, coughs, cramping, sore throat, and poor eye sight. Carrot seed oil could also relieve respiratory problems, reduce high blood pressure, promote the production of breast milk, and treat attention deficit hyperactivity disorder symptoms. Offers antibacterial, anti-inflammatory, and antioxidant properties. It may work to treat acne, clogged hair follicles, hydrate skin and hair, infections, and heal cracked skin. Jojoba oil is commonly used for sunburns, eczema, psoriasis, control dandruff, and to stop hair loss. Has anti-inflammatory properties with high levels of gamma linolenic acid and linoleic acid to protect myelin, the nerve fibers sheath. It may treat nerve pain, high cholesterol, skin conditions, bone loss, respiratory conditions, and arthritis conditions. Evening primrose oil is used for symptoms of premenstrual syndrome, menopause, attention deficit hyperactivity disorder, hepatitis B, liver cancer, obesity, and scleroderma and Raynaud’s disease. Contains antioxidant properties and healthy fats such as oleic acid. It may treat skin issues, high cholesterol, high blood pressure, pain and tenderness of joints, digestive problems, and promotes weight loss. Avocado pear oil is used for arthritis, psoriasis, heart disease, obesity, and nutrition deficiencies. We can use essential oils in multiple ways in accordance to their potency and unique chemical composition. It must be noted that factors such as the user’s age, the condition of the skin, and overall health status can affect the safety level of an essential oil. Consult with your doctor or pharmacist before using any essential oil on children, or if you are pregnant, nursing, or on medications. Always follow the usage and dosage suggested by a qualified aromatherapist. Research suggests that oils from a plant can easily be absorbed through the surface of the skin when they have a molecular weight below 1,000 molecules. This allows for essential oils benefits to be transmitted through skin and into the bloodstream. Topical use can produce adverse skin reactions such as phototoxicity and irritation. Perform a skin patch test before using any new essential oil. Another potential way for natural oil components to be transferred into the blood is through inhalation, or aromatherapy. The blood vessels of the lungs may take in the oil elements and distribute them throughout the body. Steam therapy and mechanical diffusers may offer a more safe and effective method of inhalation. Many experts advise against the internal use of essential oils, including orally. Others suggest that certain oils like lemon, frankincense, and peppermint, are safe enough to be taken orally in very small amounts when mixed with water or comparable essential oils. This is why it is vital to ingest essential oils only under the guidance of a trained and certified professional. Long-term ingestion can lead to severe damage to the digestive tract as well as the kidneys and liver. In addition to the physical health and emotional health benefits, essential oils are often used in personal hygiene products. These can include soaps, skin creams, toothpaste, and lip balms. Some oils can be used as natural household cleaners and insect repellents. Dilute, unless otherwise suggested, with olive or almond oil, or with water. Inhale by smelling the essential oil directly from the bottle itself on the advice of a certified aromatherapist. Massage two or three droplets of the essential oil, or mixture, on the palms of the hands. Apply on affected areas in a circular motion. Any ill effects or skin irritation should be counteracted with the use of a vegetable oil. The best areas to apply topically include behind the ears, on neck, on the temples, on the crown of the head, on abdomen, on upper back, on soles of feet, on ankles, or on skin surface over targeted organ. For internal use, add one to two drops in a glass of milk or water, on a slice of bread, in your favorite meal, or on the tongue, depending on individual potency of oil. Create a steam bath for inhalation by adding one to three drops of essential oil to a basin of hot water. Cover head and shoulders with towel and deeply breathe in steam. Add three drops of essential oil to a tub of warm water to relax the body and the mind. Use your hand to disperse oil throughout the water surface and soak for at least 10 minutes. Use an essential oil compress on affected area of body by adding one drop of the oil, or oils, to a small basin of warm water. Allow a facecloth to soak in mixture and apply on the area for five seconds and repeat with a freshly dipped cloth. Use a manufactured diffuser by adding drops of essential oil to be dispersed through the air in vapor form. Add two to three drops of essential oil to a cloth or tissue and place in front of a running humidifier to be circulated within a room. Do not add the oil directly to the machine. Place warm water and three drops of essential oil in a spray bottle and spray throughout a room. Essential oils have been used since ancient times to treat our various ailments, diseases, and disorders. The natural and active components of plants are extracted for use to alleviate pain, inflammation, and the effects of skin conditions, hormone imbalances, infections, bone density, dental issues, and deficiencies. As there are many possible side effects, essential oils should only be used under the care of a trained professional and with the approval of your primary health provider. “Essential Oils,” PubMed Health; https://www.ncbi.nlm.nih.gov/pubmedhealth/PMHT0025082/, last accessed August 18, 2017.
href=”http://www.healthline.com/nutrition/what-are-essential-oils#section1″ target=”_blank”>http://www.healthline.com/nutrition/what-are-essential-oils#section1, last accessed August 18, 2017. “How To Use Essential Oils,” Young Living; https://www.youngliving.com/blog/how-to-use-essential-oils/, last accessed August 21, 2017. “Methods of Use,” In Essence; https://www.inessence.com.au/methods, last accessed August 21, 2017. Jeena, K., et al., “Antioxidant, anti-inflammatory and antinociceptive activities of essential oil from ginger,” Indian Journal of Physiology and Pharmacology, Jan. to Mar. 2013; 57(1):51-62; https://www.ncbi.nlm.nih.gov/pubmed/24020099, last accessed August 18, 2017. Nordqvist, J., “Eucalyptus: What Are The Health Benefits?” Medical News Today, February 17, 2017; http://www.medicalnewstoday.com/articles/266580.php, last accessed August 18, 2017. Hamidpour, R., et al., “Frankincense: From the Selection of Traditional Applications to the Novel Phytotherapy for the Prevention and Treatment of Serious Diseases,” Journal of Traditional Complement Medicine, Oct. to Dec. 2013; 4(3): 221-6. https://dx.doi.org/10.4103%2F2225-4110.119723, last accessed August 18, 2017. “What Is Frankincense Good For? 8 Essential Oil Uses,” Dr. Axe; https://draxe.com/what-is-frankincense/, last accessed August 18, 2017. “13 Grapefruit Essential Oil Benefits – Starting With Weight Loss,” Dr. Axe; https://draxe.com/grapefruit-essential-oil/, last accessed August 18, 2017. Nordqvist, J., “What are the health benefits of lavender?” Medical News Today, September 9, 2014; http://www.medicalnewstoday.com/articles/265922.php, last accessed August 18, 2017. “7 Lavender Oil Benefits for Healing,” Dr. Axe; https://draxe.com/lavender-oil-benefits/, last accessed August 18, 2017. “10 Amazing Benefits of Lemon Oil,” Organic Facts; https://www.organicfacts.net/health-benefits/essential-oils/health-benefits-of-lemon-oil.html, last accessed August 18, 2017. “10 Proven Myrrh Oil Benefits & Uses,” Dr. Axe; https://draxe.com/myrrh-oil/, last accessed August 18, 2017. “Oregano Oil: Benefits , Uses, And More”, Healthline web site; http://www.healthline.com/health/benefits-of-oregano-oil, last accessed August 18, 2017. ”Top 25 Peppermint Oil Uses and Benefits,” Dr. Axe; https://draxe.com/peppermint-oil-uses-benefits/, last accessed August 18, 2017. “Rose Essential Oil Benefits Skin, Depression and Hormones,” Dr. Axe; https://draxe.com/rose-essential-oil-benefits-skin-depression-hormones/, last accessed August 18, 2017. “Rosemary Oil Uses And Benefits,” Dr. Axe; https://draxe.com/rosemary-oil-uses-benefits/, last accessed August 21, 2017. “13 Amazing Tea Tree Oil Benefits,” Organic Facts; https://www.organicfacts.net/health-benefits/essential-oils/health-benefits-of-tea-tree-essential-oil.html, last accessed August 21, 2017. “The Many Wonders of Calming Sandalwood Oil,” Mercola, April 27, 2017; http://articles.mercola.com/herbal-oils/sandalwood-oil.aspx, last accessed August 21, 2017. “7 Borage Oil Benefits for Skin, Arthritis and Inflammation,” Dr. Axe; https://draxe.com/borage-oil/, last accessed August 21, 2017. “13 Best Benefits of Carrot Seed Essential Oil,” Organic Facts; https://www.organicfacts.net/health-benefits/essential-oils/carrot-seed-essential-oil.html, last accessed August 21, 2017. “Jojoba Oil – Skin & Hair Healer and Moisturizer,” Dr. Axe: https://draxe.com/jojoba-oil/, last accessed August 21, 2017. MacGill, M., “Evening primrose oil: Uses and drug interactions,” Medical News Today, June 20, 2017; http://www.medicalnewstoday.com/articles/263027.php, last accessed August 21, 2017. “Why Avocado Oil Got Rx Status in France,” Dr. Axe; https://draxe.com/avocado-oil/, last accessed August 21, 2017. Bardot, J., “Post Surgery Herbal Remedies For Healing,” Live Strong, August 14, 2017; http://www.livestrong.com/article/414633-post-surgery-herbal-remedies-for-healing/, last accessed August 18, 2017. “Exploring Aromatherapy,” National Association for Holistic Aromatherapy; https://naha.org/explore-aromatherapy/safety/, last accessed August 18, 2017. Worwood, V., The Complete Book of Essential Oils & Aromatherapy (Novato: New World Library, 1991), 12-14.